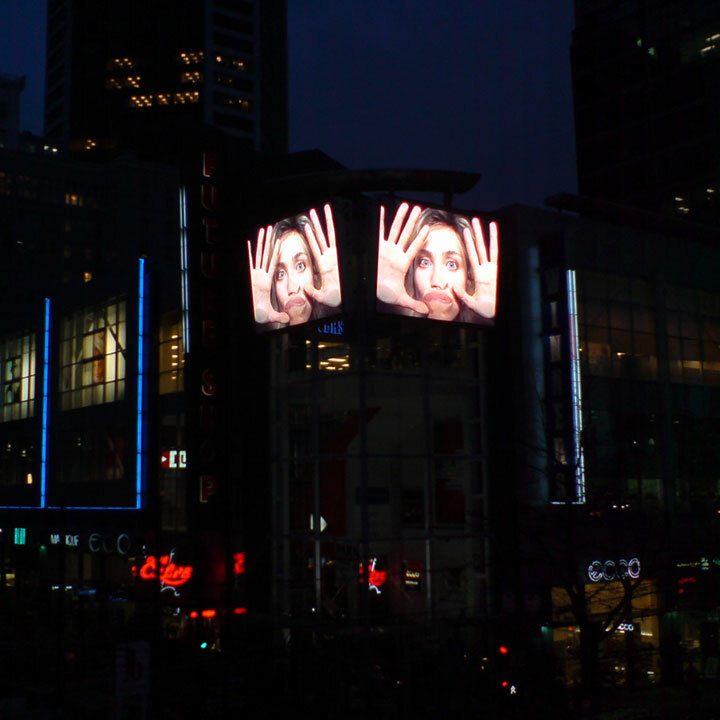 Looking Up was a curated program of one-minute artists’ projects inserted between advertisements on the Bonnis Media CoreVision dual outdoor screens at Granville and Robson Streets in downtown Vancouver. As a site and context for artists’ projects, the dual screens in the centre of the city’s entertainment and cultural district presented a highly visible urban location that attracted the attention and interest of Vancouver’s diverse populations. Until the Looking Up series, the dual screens had been used solely for advertising. Broadening this strictly commercial use, Other Sights utilized the screens as new platforms for artistic creation. Projects were curated by Barbara Cole, Colin Griffiths, Karen Henry, and Melanie O’Brian.Looking Up was made possible through the invaluable contributions of The Canada Council for the Arts, the province of BC through the BC Arts Council and the Gaming Commission, the City of Vancouver, and Artspeak donors.